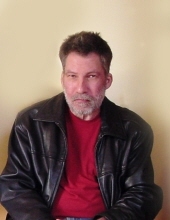 John Marvin “Sonny” Boss, age 62 of Lone Oak, passed away at 12:05 p.m. Tuesday March 5, 2019 at Stonecreek Nursing and Rehabilitation after an extended illness. Sonny was born in Paducah on Jan. 8, 1957, was a member of Lone Oak United Methodist Church, a 1975 graduate of Lone Oak High School and held a certificate in Highway technology from the Paducah Area Vocational School. He held several jobs over the years but his career was that of a drummer. According to those who know music, he was a world-class percussionist. He played for numerous bands over the years, traveling over-the-road extensively. His proudest performance was opening for a Loretta Lynn concert. Sonny had a great love for music and his pet dogs. Sonny learned of the Paducah Housing Authority “Operation Fresh Coat” program from an ad in Paducah Sun and began work in June of 2005 painting and found great enjoyment in this work. He also volunteered at Paducah Cooperative Ministry. The kind-hearted and generous spirit that Sonny had will be greatly missed by his family and friends. Sonny is survived by his mother, Ann Padgett Boss; a sister, Sherry (Wayne) Golightly; two brothers, Shane (Diane) Boss and Sam (Lisa) Boss; six nieces and nephews and five great-nieces and nephews; several aunts, uncles and cousins. Preceding in death was an infant daughter, Natasha and his father, John Duke “Jack” Boss. Memorial services will be held Saturday, March 9, 2019 at 1:00 p.m. with Rev. Sam Chambers officiating. Urn entombment will follow at Woodlawn Memorial Gardens. Visitation will be held Saturday, March 9, 2019 from 11:00 a.m. until service time at the funeral home. Expression of sympathy may be made to Lone Oak United Methodist Church, 3835 Old U.S. Highway 45 South, Paducah, Kentucky 42003 or to McCracken County Humane Society, 4000 Coleman Road, Paducah, KY 42001.